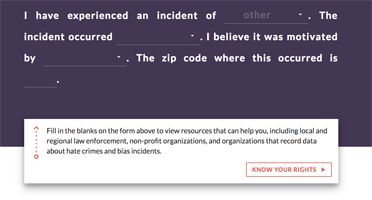 A screenshot of hatecrimehelp.com from CuroLegal. Hatecrimehelp.com, was built in collaboration with Cisco Systems and the American Bar Association’s Center for Innovation, according to a press release. Someone who believes they are the victim of a hate crime answers several questions, including the type of incident experienced and the location, even if it happens online. Based on the answers, the app generates information on how to contact local law enforcement and other government resources and nonprofits that may offer help. The app also offers comparisons between state and federal hate crime laws. “In light of the increased reports of hate crimes in this country in recent months, our goal is to provide clarity on the law and available resources, and to appropriately set expectations for what help is available from those resources,” Nicole Bradick, CuroLegal’s chief strategy officer, said in a press release. The application was inspired at a March design event at Suffolk University Law School, where the theme was responding to hate crimes through technology.